In February 2010, at the advent of the Chinese Year of the Tiger, the World Wildlife Fund (WWF) reported that tigers were in crisis around the world. With as few as 3,200 left of this endangered species compared to 100,000 a century ago, it was clear that this would be the vital tipping point for tigers. Two key causes of the tiger’s plight are (1) poaching to feed consumer demand for tiger body parts, mostly for use in traditional Asian medicines (TCM) and folk remedies, and (2) deforestation as more and more forests are cleared for paper and palm oil, tiger habitat disappears daily. A new study by WWF scientists and partner organizations has found global climate change could shrink Bangladesh’s Sundarbans tiger habitat by 96 %, potentially reducing the tiger population to fewer than 20 breeding individuals! An estimated sea level rise of 11.2 inches above 2000 levels by 2070 means this unique mangrove ecosystem could disappear within half a century. The Sundarbans delta is the largest mangrove forest in the world. This UNESCO World Heritage Site is shared by India and Bangladesh and sits at the mouth of the Ganges River. It is home to an estimated 254-432 Bengal tigers, the only tiger population adapted to live in mangroves. The tigers here regularly swim between islands and are the only tigers to have crabs and other seafood as an important part of their diet. The area is an amazing ecosystem that houses a plethora of species including the spotted deer (the tiger’s prey), water birds, many kinds of fish, marine mammals, crocodiles, and snakes. The landscape naturally protects the area from natural disasters such as cyclones, storm surges, and wind damage. The mangroves are home not only to endangered fauna like tigers, but also to several million people who depend on the Sundarbans for their livelihoods. The Bengal tiger population has already been under threat from poaching and habitat destruction and loss, and research suggests that the seas may be rising faster than originally thought. Worldwide, tigers occupy only 7 percent of their historic range with as few as 3,200 left in the wild. The study encourages local governments to take immediate action to conserve and expand mangroves while cracking down on poaching. It suggests that globally, countries should work strongly on reducing greenhouse gas emissions in order to save the Sundarbans. The Siberian tiger is a tiger subspecies inhabiting mainly the Sikhote Alin mountain region with a small subpopulation in southwest Primorye province in the Russian Far East. In 2005, there were 331–393 adult-subadult Amur tigers in this region, with a breeding adult population of about 250 individuals. The main threats to the survival of the Siberian Tiger are (1) poaching, (2) habitat loss, and (3) illegal hunting of ungulates, which are tigers’ main prey (Ed: looks similar to a lama). Because they increase access for poachers, roads are another important threat to the Siberian tiger. Intrinsic factors such as inbreeding depression and disease are also potential threats to this big cat, but are less understood. Roads in Amur tiger habitat, Russian Far East Wildlife Conservation Society (WCS) research has demonstrated that human-caused mortality accounts for 75-85% of all Amur tiger deaths. Current estimates indicate that 20-30 tigers are poached in the Russian Far East each year, although actual numbers may be higher. Population modeling based on Siberian Tiger Project field data suggests that poaching rates exceeding 15% of the adult female population could have dangerous repercussions, especially as tigers have fairly low population growth rates compared to other big cats. Analysis of mortality data in Sikhote-Alin Biosphere Reserve indicates that poaching rates may be at least this high in a significant area of Russian tiger range. Tigers are most commonly poached for their fur and for their body parts, such as bones, that are used in Traditional Chinese Medicine. The opening of the border between China and Russia after the fall of the Soviet Union has now made it possible to easily transport goods to Chinese markets and beyond. Although tigers are a protected species in Russia, enforcement agencies have very limited ability to catch convict poachers, and, even when this happens, fines are relatively small and disincentives insufficient. Poaching problems are further exacerbated by low incomes in many rural areas of the Russian Far East – sale of a tiger skin and bones represents a substantial source of income for poor people in remote villages. It is also common for hunters to poach tigers to eliminate competition for ungulates and for locals to kill tigers in retaliation for depredations on domestic animals such as dogs and cows. 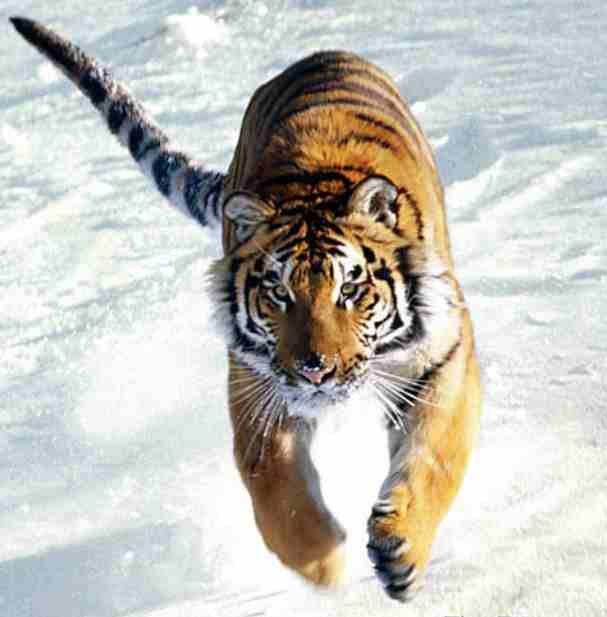 In Russia, human population growth does not threaten habitat as it does in many other tiger-range countries. However, activities such as logging, grazing, various development projects and uncontrolled fires are all resulting in direct habitat loss in the Russian Far East. Habitat is increasingly being divided into isolated patches, particularly at the southern edge of Amur tiger range. Logging takes place in most of Amur tiger habitat. Although existing guidelines for timber harvest are actually quite sufficient, significant illegal logging and overharvest still occur. Selective logging, rather than clear cutting, is most common in tiger habitat, and does not seriously impact the quality of the habitat, if access to the extensive road system is controlled (thereby limiting poaching). Fires are another important form of habitat loss. Many local residents consider fires to be the main cause of loss of forest habitat in parts of Primorsky Krai, and Amur tigers avoid areas that have burned, as they provide neither adequate cover for hunting, nor the habitat needed for prey. Illegal hunting of ungulates such as deer and wild boar significantly reduce prey availability for tigers. While official estimates continue to report stable numbers of ungulates, many hunters and wildlife biologists believe that abundance of ungulates in the Russian Far East has decreased considerably over past 15 years. Analyses from WCS’s Amur Tiger Monitoring Program clearly demonstrate that ungulate numbers are often 2-3 times higher inside protected areas, which are nonetheless impacted by poaching, though to a lesser extent. Low ungulate numbers also foster a sense of competition between hunters and tigers. When ungulates numbers are low, it is easy to blame tigers, even when the root cause of population declines is over-harvest by humans. When there is little prey available in the forest, tigers sometimes enter villages and prey on domestic animals, including dogs and livestock, which creates tiger-human conflict situations. The number of roads in Amur tiger habitat is increasing steadily as logging activities and development push into even the most remote regions. Besides allowing greater access for poachers, roads increase tiger mortality from vehicle collision, and increase the probability of accidental encounters between tigers and people, leading to tigers being shot out of fear or opportunity. Roads also provide poachers greater access to ungulate habitat, which reduces tiger prey abundance. Roads can be divided into two categories: primary roads, which are maintained year-round and provide access between villages and towns; and secondary roads, which are not regularly maintained but nonetheless allow access. These results clearly demonstrate that the presence of both secondary and primary roads both greatly increase the odds of tigers being poached, and indicate the need for road closures and access control. (Ed. Main roads contribute to tiger road kill reducing tiger populations by about a half). the number of the big cats has shrunk by 60% over the past three to four years! …Pandav said during a visit to Sweden. A century ago, some 40,000 tigers roamed the Indian subcontinent, according to the WWF, which singles out poaching, widespread destruction of the tigers’ natural habitat and human hunting of their prey as the main causes of today’s dire situation. “Poaching is primarily to meet the demand for tiger bones in Traditional Chinese Medicine (TCM)… That’s the immediate reason behind the decline of tigers,” Pandav explained. “The situation is pretty bad in the sense that they (the tigers) are rapidly being wiped out from many parts of their range,” he added. The United States is the world’s second largest market for tiger products. “Despite all the problems, there are a couple of places in India (where tigers) are doing pretty well,” he said. “The Chinese government is actively planning to legalise the trade (of tiger products) and if they legalise this trade then the demand for wild tigers is going to increase many fold,” he said, pointing out that people preferred products from wild tigers over farmed animals. That is going to be the death blow for the tigers in the wild,” he said. ‘At the beginning of this year, a ground-breaking, new, and scientific tiger census, which took two years to complete, announced that there were 1,411 wild tigers left in India. By November, the Government had admitted that of that number, 14 tigers had been poached this year. The figure actually may be nearly double. The poaching cases registered and seizures of body parts of tigers this year show that around 27 of the big cats have been killed in 2008, making the number of wild tigers in India less than even 1,400, and showing that government efforts have failed so far to deter poachers. 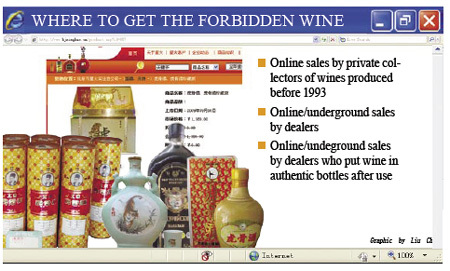 …says an official from the NTCA. Data compiled by the WPSI shows an equal number, 27 tigers, were killed in 2007. 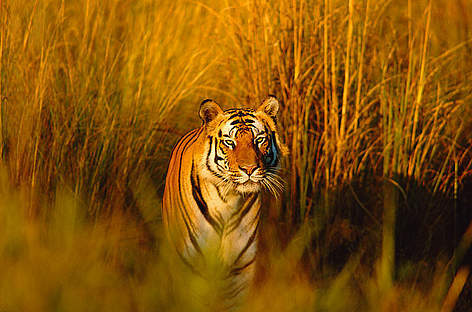 In January, a tiger survey commissioned by the Government indicated that there were only five-seven tigers left in Panna. Now, tiger experts fear the number may actually be just two. Kanha, also in Madhya Pradesh, lost a tiger to poaching by electrocution, using an 11,000-volt current, this November. According to data compiled by the Wildlife Protection Society of India (WPSI), there have been 27 instances of tiger skins and parts being found in different parts of the country in 2008. The Wildlife Crime Control Bureau (WCCB), which came into existence this year, recovered a tiger skeleton from Gurgaon and two tiger skins from Himachal Pradesh, a case that involved a Tibetan national. A WCCB official said their main problem was that the trade in tiger parts was trans-country and inter-state, necessitating strong intervention from the Centre. “Day before, we managed to get a case registered in Bihar for Dariya, a tiger poacher, who was arrested in December in Katni, Madhya Pradesh. A case had to be registered in Bihar where he is suspected to have poached tigers from the Valmiki tiger reserve. We have to expedite history-sheeting quickly to facilitate arrest of poachers who travel and escape extensively,” he added. “The fact that tiger numbers are going down but poaching remains constant is a huge cause for concern. The number of tigers as per the Census is very low. If we don’t improve protection, India may well lose its tigers,” says Belinda Wright, Executive Director, WPSI. Videos in 2010 on the Bengal Tiger by big cat expert Dr. Alan Rabinowitz i, hosted by the BBC on its Lost Land of the Tiger series. What if tigers did become extinct? The tiger is at the top of the food chain in all the ecosystems it lives in. If one species in a food chain becomes extinct there is a knock-on effect on other species. The loss of a main predator can actually cause the extinction of a prey species as greater competition presents a threat to a species. When the Bali and Javan tigers became extinct in the 20th century, poachers turned their attention to the Sumatran tiger. 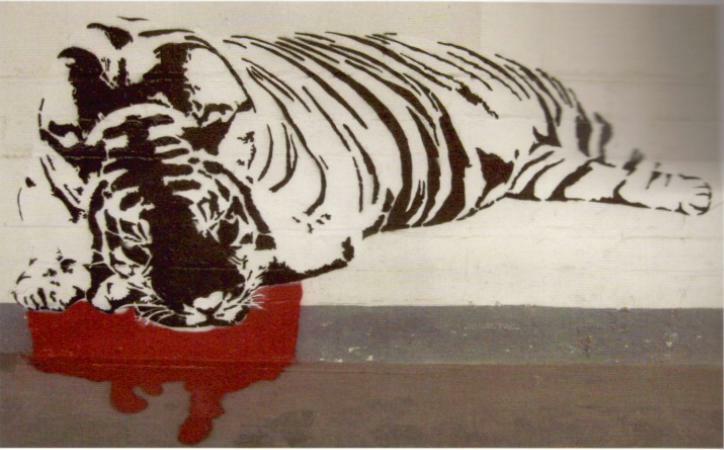 Which animal will be exploited into extinction once all the tigers are gone? If tigers were to go, the forests which are currently protected as key habitat would be more likely to fall victim to illegal logging, conversion to agriculture and development. This leads to greater CO2 emissions and climate change. Deforestation currently accounts for 15% of global greenhouse gas emissions. Which species live alongside the tiger? 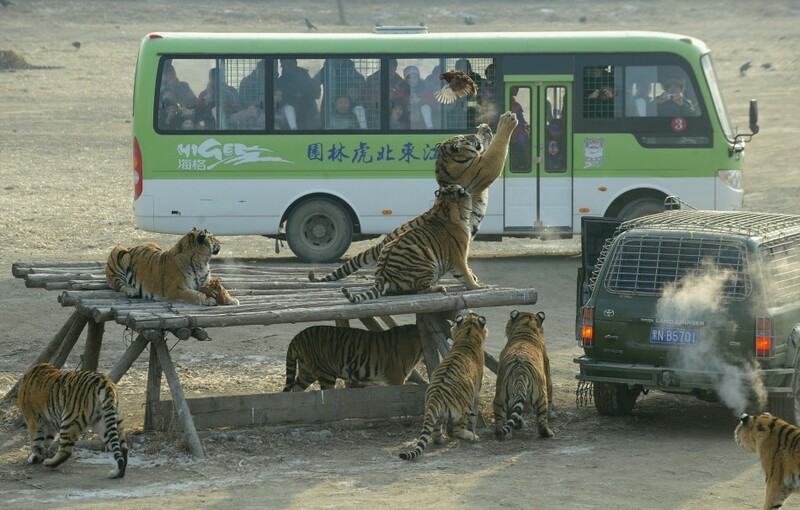 A herd of Siberian tigers chased and devoured live chicken flung at them from a tourist safari bus at the Siberian Tiger Forest Park in Harbin, north-west China, on Tuesday. In China, only about 20 tigers are thought to be left in the wild! ~ Ge Rui, Asian Regional Director of the International Fund for Animal Welfare. This entry was posted on Wednesday, December 28th, 2011	and is filed under Threats from Bushfire, Threats from Deforestation, Threats from Poaching and Poisoning, Threats from Road Making, Tigers.